The EU does not condemn the anticommunist persecution in Poland, but even seeks to justify it. The answer of the EU commission is unacceptable in relation to the question of the KKE’s delegation in the European Parliament regarding the unacceptable decisions of the Polish courts against members and cadres of the CP of Poland, with sentences of up to 9 months in prison, because it is considered an “offense” and crime to disseminate their ideas in the “Brzask” newspaper and the website www.kompol.org. Not only did it not condemn the anticommunist persecution, but it even attempted to legally justify it by invoking the non-application of the reactionary EU Charter of Fundamental Rights. While the Commission and other EU bodies are very noisy in other instances that are convenient for their interests, in the face of the anticommunist hysteria it pretends to “wash its hands of it”. While it presents itself as being … sensitive and an unsolicited “defender of human rights”, intervening in the internal affairs of states all over the world, using all forms of imperialist interventions and pressure, it finds nothing to say about anticommunist persecution and bans. The EU’s stance is no surprise, as it plays a leading role in the anticommunist campaign and clears the way for its governments, justifying and in practice applauding the laws that are being pushed forwards on the basis of its own anticommunist guidelines and ahistorical declarations. The government of Poland is providing its credentials both to the EU and NATO, whose recent summit it hosted, via these persecutions. We are referring to a NATO Summit that took dangerous decisions at the expense of the people. This is their class-based democracy, the dictatorship of capital. The KKE will intensify its struggle so that the people will denounce and isolate the anti-communism of the EU and its government, so that they seek to learn the historical truth that will shine brightly against the anticommunist persecution and bans, against the ahistorical distortion of socialism and the provocative slanders at the expense of the communists. Solidarity with the Polish communists. Hands off the CP of Poland. Freedom of expression and information is a fundamental right enshrined in the EU Charter of Fundamental Rights. The Commission seeks to ensure respect for those rights within its powers under the EU Treaties. According to its Article 51(1), the EU Charter applies to Member States only when they are implementing European Union law. The issue raised by the Honourable Member does not pertain to the implementation of Union law. Therefore the Charter is not applicable. "Recently members and cadres of the CP of Poland were convicted by the regional court of Dąbrowa Górnicza to prison sentences of up to 9 months, many months of "limited freedom" and compulsory social work and also fines, because the dissemination of their ideas through the newspaper "Brzask" and the website www.kompol.org is considered to be an "offense" and a "crime".The court in order to convict them, following the anticommunist positions of the Polish authorities, utilized rotten and groundless accusations regarding "the public promotion of a totalitarian system". This is part of their attempt to cancel and slander the gains of the workers under socialism, the right to work, labour and social rights. The Polish authorities have for some years provocatively banned the communist symbols and now convict the communists, invoking "democratic values". Similar anti-communist persecution, convictions and bans against CPs have also been imposed in other EU member states, with the open support of the EU which has elevated anticommunism into being its official ideology, something that goes hand in hand with the intensification of the anti-people onslaught. Now there is enough evidence so that everyone can understand what the EU's declarations about the "values of freedom and democracy" really mean. 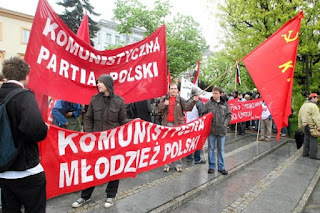 The Commission is asked: Are the banning and persecution of the communist ideology, the criminalization of the expression of communist ideas and of the activity of communists imposed by the authorities and government of Poland part of the EU's "values"?